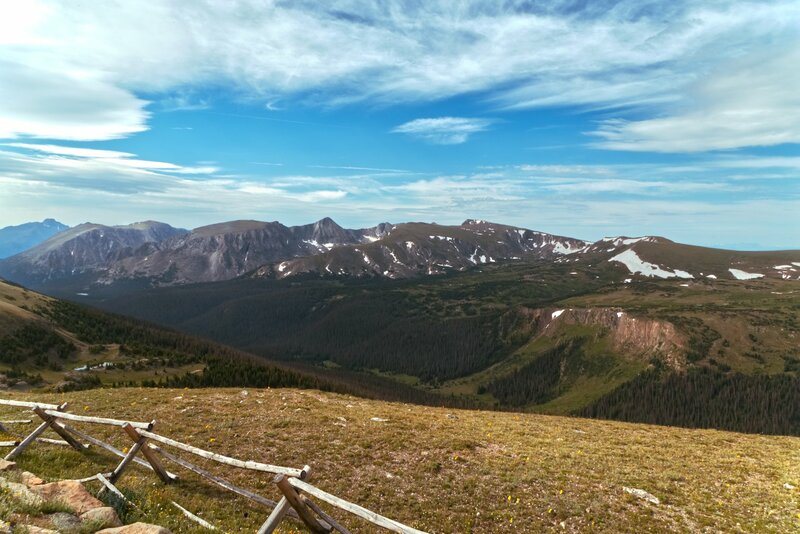 Here is a pano from atop the Rocky Mountains in Colorado at about 14,000 feet above sea level. It consists of 10 raw images all stitched together in AP and then edited. It is probably greater than 180 degree view so there is a bit of image warp that I didn't do much with. But it does give you a really beautiful view of the Rocky Mountains and what you would see as you look around. Another gorgeous panorama. However, the bottom right quadrant looks to be all dark shadow with no detail visible. It looks like a candidate for a combination of HDR and Panorama. Ideally you take your bracketed images for each segment at the same time. However, as you took Raw images, then you may be able to develop the images first to extract the detail from the lower parts, using the same procedure for each photo. You would then need to save as developed images before applying the Panorama stage. I also like your second image. We do not have mountains like this in the UK. The best I have been able to manage are the High Atlas in Morocco. I agree, it is dark compared to the right side. If you click the image to enlarge it, you do see more detail. I was thinking about adding some overlays to lighten that region up but chose not to. To be honest, I think the field of view is a bit too large (greater than 180 degrees) for it to be a good panorama. But because of the distance of the mountains you don't see a huge amount of visible image warp. I remember taking these images over two years ago and thinking the view was just amazing. These mountains are about 2000 miles west from where I live. For two summers I took a month off each year and traveled out west and spent the time camping throughout the region...from arid deserts to mountain vistas. I have tons of amazing photographs. I actually hosteled throughout England and Scotland back in the late 1980s traveling from London all the way to Orkney islands off of John O'Groats. There is some fantastic diverse landscape on that trip as well.